Downtowns, or central business districts, have been well-studied in the economic literature, but The Metropolitan Revolution is one of the few texts I’ve seen that not only mentions midtowns but posits that they hold the key to future regional economic growth. A midtown typically was a secondary business district that arose to serve the wealthy, uptown residential precincts, and eventually attracted some of the “nice” amenities that wealthy residents wanted to have close to home and away from the congestion of downtown. Yet, as eds & meds employment in particular have boomed, these tranquil bastions have become employment centers in their own right, and perhaps regional economic strategies should zero in on linkages between these areas and other regional economic nodes — and to the likely-interesting neighborhoods around them. Detroit is drawing a new geography of innovation, tearing down the traditional, artificial borders that have long divided downtowns and midtowns in the United States. 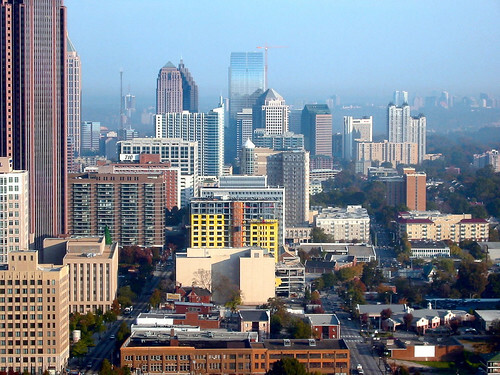 Virtually every major city in this country has a strong central business district (mostly for the congregation of government, corporate headquarters, entertainment venues, and some cultural functions), a strong midtown area (where eds and meds and historic museums tend to concentrate), and a state-of-the-art transit corridor, mostly built within the past twenty years, connecting the two. Each of these discrete building blocks brings particular assets that, in turn, provide a platform for a key element of innovation district growth. They point to Detroit, Houston, Cleveland, and Buffalo as prime examples, and mention Atlanta, Denver, Indianapolis, Minneapolis-Saint Paul, Pittsburgh, Philadelphia, Phoenix, Syracuse, and “even Las Vegas” in passing. At first, I was a bit taken aback by the certainty of saying that “virtually every major city” fits this pattern, but I can’t think of many that don’t, particularly if one applies a geographically expansive definition to “midtown.” Strong examples include Westwood in LA, Longwood-Fenway or Cambridge in Boston, OSU in Columbus, or West End-Delmar in St. Louis. Sometimes downtown and midtown seamlessly blend with the CBD, as with Foggy Bottom & Georgetown in DC, McGill in Montreal, or Streeterville in Chicago. It’s also intriguing to think that, with policies and investments directed towards creating a cohesive neighborhood, anchor institutions could be aggregated into a midtown which either never existed or deteriorated due to regional growth dynamics. UIC-Medical Center in Chicago is an obvious candidate; Howard-Washington Hospital Center in DC is another. In that instance, development of the McMillan site creates that missing physical link between the two. [T]he people who deliver innovation districts would constitute a new network of metro builders who cut across disciplines, programs, practices, and professions. Modern society has deified specialists and technicians who diagnose and strive to fix discrete problems–say, traffic congestion or slum housing. Metro builders, by contrast, would be fluent in multiple city “languages”–architecture, demographics, engineering, economics, and sociology–and be cognizant of theory and practice. They would see the connections between challenges and work to devise and implement policies that advance multiple objectives simultaneously. Midtowns superceded the original CBDs in NYC, LA, London, Paris, and Tokyo, among others, a process helped along in most cases by changing transportation and industry. In most of those, regional/commuter rail was restricted from the old downtown, so new business centers arose around the train stations; in LA, it was highway access that spurred the leap to the west side. Yet even in those cities, today’s most dynamic areas are often those between, e.g., Silicon Alley and Hollywood. Somehow, I don’t think that similarly huge transportation leaps are in the offing for this generation, but investors might look to downtown-midtown infill opportunities as particularly investment-ready places.